GRAND RAPIDS, Mich. August 11, 2015 – ArtPrize, the radically open international art competition decided by public vote and expert jury, today announced volunteer registration details for its seventh annual event. ArtPrize seeks volunteers—who, through their energy and dedication form the bedrock of the visitor experience—to fill over 13,000 volunteer hours this fall. The ArtPrize Volunteer season will begin with the Volunteer Kick-Off Event: Seven Neighborhoods | Seven Stories on August 20 and will continue through October 11. Volunteers remain an integral part of the ArtPrize event, with almost 1,000 individuals, friends, families, and groups stepping forward each year—poised to welcome over 400,000 visitors to Grand Rapids. The kindness and tenacity with which these volunteers approach their tasks serves to keep ArtPrize a community-driven event, with many locals playing a central role in its continued success. Volunteer schedules will open to the public on August 21 at 9 a.m. EDT. The online self-registration and schedule-building system at artprize.org allows volunteers to select the positions and shifts to meet their unique interests and availability. Although volunteers may sign up for whichever shifts they would like, they must be sure to attend a training session before the event begins in order to qualify for their selected shifts. Volunteers may log into their volunteer accounts to view the schedule and select their desired shifts through October 11; new volunteers must create a volunteer account by September 15 at 11:59 p.m. EDT. The ArtPrize volunteer season will launch with the annual Volunteer Kick-Off Party: Seven Neighborhoods | Seven Stories. Everyone is invited to join in at this community event, a celebration of our volunteers and the upcoming ArtPrize season. This year, attendees will share stories and unique experiences from each of the seven ArtPrize neighborhoods, including light refreshments, live music, and lawn games. Those interested in volunteering will have the opportunity to create a volunteer account on-site throughout the party. The ArtPrize Volunteer Kick-Off Party, presented by Lake Michigan Credit Union, will be held at New Vintage Place, 889 Broadway Ave. in Grand Rapids on August 20 from 5 – 7 p.m. EDT. The required Volunteer Training for ArtPrize Seven will offer morning, afternoon, evening, and weekend sessions from September 13 – 16 at the ArtPrize HUB. During training, volunteers will hear from ArtPrize staff and partners about the event’s history and how it functions, as well as learn more about their specific shifts and what to expect out of their volunteer experiences. ArtPrize Volunteer Leads—who work directly with the ArtPrize Volunteer staff to direct and place volunteers during the 19-day event—will receive training the week prior. 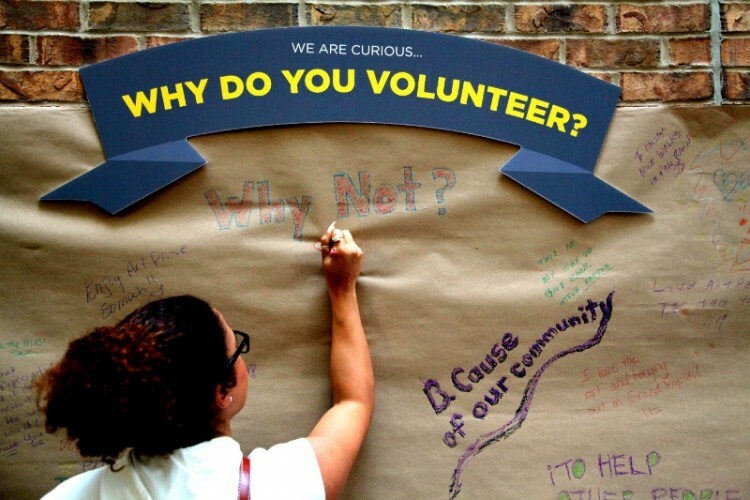 There are a variety of volunteer opportunities to fit everyone’s schedule and interests during ArtPrize Seven. HUB Volunteers greet visitors inside The HUB and at the pop-up park, assist in the retail space, and act as docents for the reinstall of Intersections inside the ArtPrize HUB Soundstage. Wayfinders serve as ArtPrize tour guides and ambassadors of downtown Grand Rapids, stationed around the ArtPrize district; equipped with maps and resources to welcome visitors, they provide directions, answer questions, and promote activities and Venues in the surrounding area. New volunteer opportunities for ArtPrize Seven include the MLive Info Booths which will be stationed around the ArtPrize district and working at our Access Art Lounge. Additional opportunities can be found at artprize.org/for-volunteers. For those who wish to get involved but cannot share their time through the traditional ArtPrize volunteer program, Artist Hosting presents an equally important opportunity. ArtPrize attracts artists to Grand Rapids from around the world. Each year, ArtPrize helps match out-of-town Artists with volunteers offering free temporary housing, offsetting some of the cost associated with participating in the event. The deadline to register for the Artist Hosting program is September 3. Please e-mail exhibitions@artprize.org for more information. Volunteering with ArtPrize is not without its perks. Every ArtPrize Volunteer receives: a free Event Guide with map; an ArtPrize Metro Card for free public transportation—10 rides on The Rapid and unlimited rides on the Silver Line BRT system; access to the Volunteer Lounge located at 50 Monroe for refreshment and relaxation; and a daily raffle entry to win exciting prizes donated by local businesses and organizations. For every three shifts completed, volunteers earn discounts towards purchasing merchandise at the ArtPrize Retail store located in the HUB and, after completing five shifts, each volunteer will earn an exclusive ArtPrize volunteer gift. For details on ArtPrize’s volunteer program and how to register, visit artprize.org/for-volunteers. ArtPrize Seven will run from September 23 to October 11 in downtown Grand Rapids.